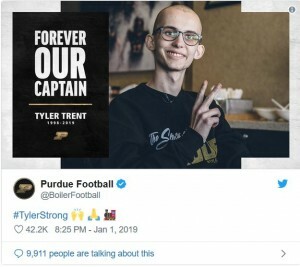 Purdue University super football fan Tyler Trent has passed away at 20 years old after his long battle with a rare bone cancer. 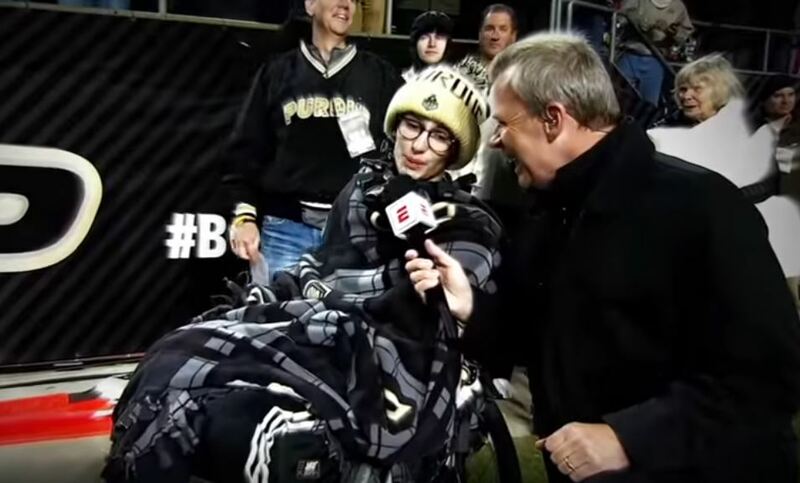 The folks at Purdue have known who Tyler is for quite some time; however, the rest of the world really got to know this inspirational kid this year. Most prominently when this courageous 20 year old willed and inspired Purdue to a shocking upset of then undefeated Ohio State (VIDEO). It was a game that transcended football and brought a dose of reality and real world issue to a game. It was the biggest upset of the college football season and a gift to a dying child. How one deals with adversity, defines a person forever. Tyler, you are a hero and an inspiration. Tyler interviewed during the Purdue -Ohio St game. Tyler Trent, the former Purdue student who inspired countless sports fans with his gratitude and grace, died from a rare form of bone cancer on Tuesday. He was 20 years old. Trent first earned the admiration of the Boilermakers football team by camping outside the stadium in September 2017 prior to the team’s Big Ten home opener against No. 8 Michigan. He posed for a picture with head coach Jeff Brohm the morning of the game. Trent did not initially tell Brohm that he had spent the previous afternoon at a chemotherapy session to treat osteosarcoma. May the peace of the Lord be with you, your family, your friends and all the lives you touched. Rest in Peace. Tyler Trent was just recently in Nashville, Tennessee as the Purdue Boilermakers took on the Auburn Tigers in the Music City Bowl. Unfortunately, not all stories have a happy ending. We all knew that Tyler had terminal cancer, we just never thought it would take him so fast. Meet Tyler Trent … please watch the below video.